You've been treated to Marcy's bead embroidery work before here on Beading Arts! 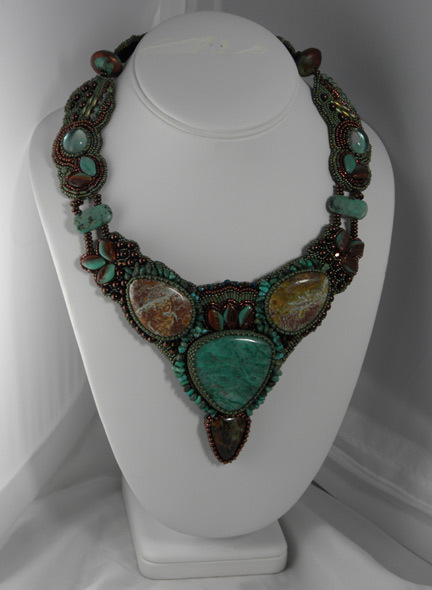 Well, this time she wrote to me to share a wonderful bead embroidery necklace that she has finished. Marcy has more work posted on her blog, Queen Marcy Originals. I was happy to learn that Marcy has joined the Bead Journal Project this year, so I'm looking forward to seeing her work each month. And get this: she's only been doing bead embroidery for about two years! 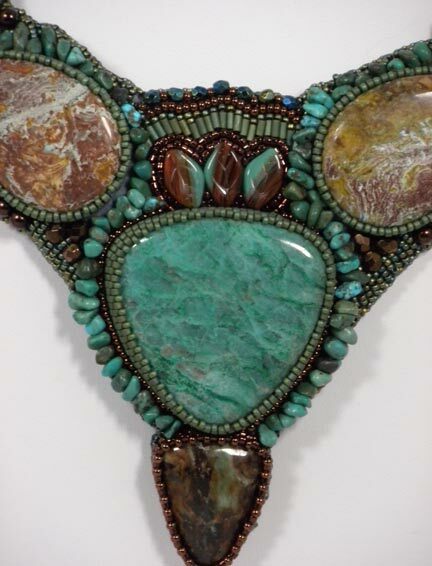 The inspiration was my love of turquoise and copper together. I have taken a couple of beading classes from Sherry Serafini because I wanted to learn bead embroidery and now I am totally hooked. My beadwork is entirely free-hand, I do not make or use any pattern, I just let the piece "speak to me" and go-with-the-flow as far as which color or what beads to use. I set the large cochibons first and then do peyote around them to bezel, then spread out from there with various size, color and styles of beads, mixing them up to create texture and dimension. Marcy, that is simply stunning! Thank you for sharing it with Cyndi and all of us. This is wonderful!! Lovely colors. Cyndi, thank you so much for featuring my latest project! Your blog is such an awesome way to see what other artists are up to! It's my pleasure to share a gorgeous piece like this with everyone. Thank *you* Marcy!